Description: This is a real cute Scottie Dog wearing a sweater. Made by All Night Media, it is from the Mary Engelbreit collection. Description: This little charmer fom All night Media is sure to please! 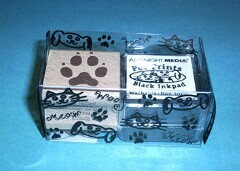 Individual Mini Gift Set includes a wood-mounted Dog Paw stamp and a washable, non-toxic, black inkpad. Great for party favors, stocking stuffers, little "thank you's" and more! Size: Stamp size is 7/8" X 1". Pad Size is 1" X 1"
Description: Give your hand made cards and scrapbooks a personal touch with this whimsical character called "Bonehead". He is so cute and perfect for any dog lover. Description: This stamp comes from River City Rubber Works and is cute by itself but also goes with the "Fleas Navi-Dog" stamp to make special christmas cards. Perfect for any dog lover! Size: Image is 2 1/4" x 1 7/8"
Description: This stamp is from River City Rubber Works. It makes for a very cute Christmas card with used along with stamp "Scratching Hound" found in our dog stamp section. Perfect for any dog lover! 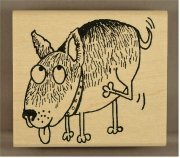 Size: Image is 3 7/8" X 1/2"
Description: This stamp comes from Rubber Stampede and is a medium size paw. Nice for scrapbooking and cards! Perfect for the dog lover!! Size: Image size is 1" X 1"